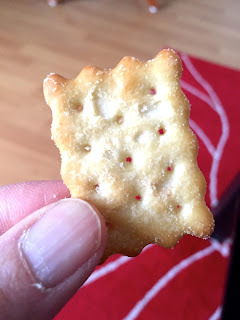 My friend Grant told me about Chicken in a Biskit Baked Snack Crackers. Have you heard of these? I’ll let him enlighten you. “I have a fairly large portion of my family who hail from such strange foreign lands as Missouri, Oklahoma, and Tennessee, and my entire life I've encountered these things lurking in the cupboards of my relatives. I hail from a strange foreign land myself (Kentucky, down near the Tennessee border) and yet I’d never encountered Chicken in a Biskit so I had to give them a try. The first thing I was struck by was how little they taste like either chicken or a biscuit. (I suspect that they may have spelled it “Biskit” for legal reasons.) The flavor is more “sour cream & onion” (and not great sour cream & onion at that). Still, I get what Grant is saying. I probably could eat a whole box without really enjoying them all that much. Their weirdness kind of compels another. Then another. But that’s not enough for me. I wanted to see if I could make them taste a little better. The back of the box suggests adding spray Cheez but since I didn’t have any handy I brought out the big guns: BBQ sauce and pickles. That’s what I’d put on a real chicken biscuit. Maybe they'd dress up a Chicken Biskit. It was worth a shot. As I crunched down my taste buds were hit hard by the pickle/sauce combo. It mercifully overwhelmed the pseudo sour cream and onion. Then a couple of chews into the bite things changed. When the cracker was sufficiently crushed up and spread around my mouth the taste came rushing in and, amazingly, it really was kind of like a chicken biscuit dressed with a dill slice and a shot of barbecue sauce. Not bad. Do I recommend them? If you're looking for a cracker that you can eat straight out of the box, no. I mean, you'll eat them like that. You'll eat them all for some reason. Don't get yourself caught in that vicious cycle. But if you're willing to take the time to dress them -- whether it's with BBQ and pickles, Cheez, Froot or possibly something Creemy -- they might be worth a try.